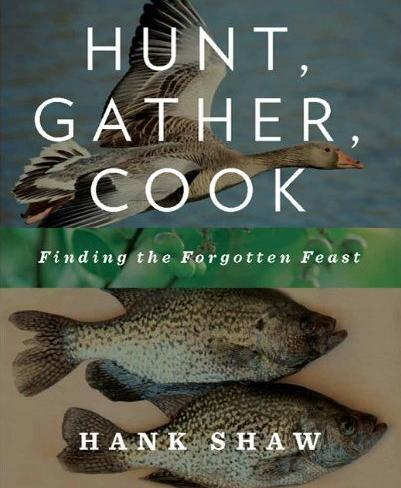 If you’re following Hank Shaw or Holly Heyser’s blogs, you’ve already heard about Hank’s new book Hunt Gather Cook: Hunt, Gather, Cook: Finding the Forgotten Feast . It’s just out from Rodale Press, and it fills an important gap in the books already available on this topic. You can find it at both blogs, elsewhere online, and at bookstores everywhere. Even if you’re already a dedicated forager, angler, and hunter, you’ll learn a lot from this book. If you’re a total beginner, you’ll really learn a lot. Not many people have Hank’s knowledge of all three areas. Even fewer have his knack for explaining things so simply and clearly. Hank used to be a political writer, but he probably had a lot more fun writing this book. He’s also a former chef, the kind of guy who’s written for both Food & Wine and Field & Stream. Now how many people can say that? If you’re like me, you tend to get in a rut now and then. Maybe it’s time to get up some gumption and try a few new recipes beyond the usual fried fish, fried birds, and fried venison. It’s time for some inspiration, the kind you’ll find in this book. Most important, this book will inspire huge numbers of people to get out of the house and get out on the water or out in the woods. Getting more people to take that first step will be Hank’s most important accomplishment. But if you’re already getting outdoors and bringing back an occasional dinner, then you’ll find inspiration in these pages, too. And who knows? Your dinners just might become a little tastier. Al, thank you so much! I really appreciate your kind words. Aw, shucks. You’re welcome. But hey! They’re all true words. Great book.